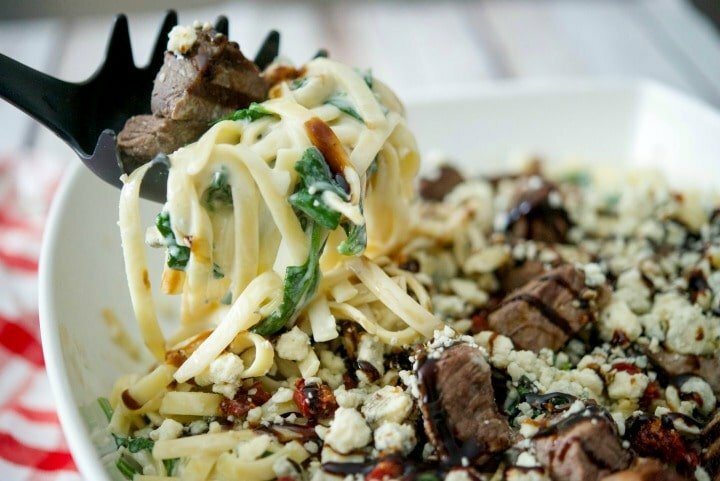 Make this popular Olive Garden recipe for Steak Gorgonzola Alfredo at home. 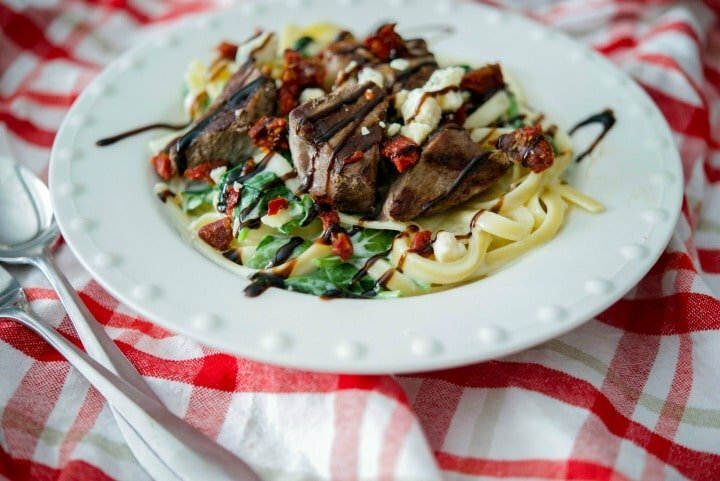 Grilled steak over fettuccine alfredo tossed with fresh spinach and Gorgonzola cheese; then topped with sun dried tomatoes & balsamic drizzle. 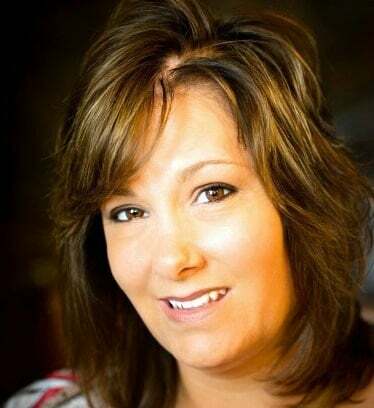 We know Olive Garden does not have the best Italian food around; especially living in northern NJ where there are far more superior mom and pop Italian restaurants all around us. However, we consider these mid range restaurants (Olive Garden, Outback, Applebee’s, etc.) our family’s “fast food” since we don’t eat at the typical fast food restaurants (Wendy’s, McDonalds, etc.). If we’re out shopping for the day or just want to grab something out to eat that’s decent, we head to Olive Garden. It’s not very pricey and you can get a decent meal. I like trying something new whenever I go and the last time I went I had their Steak Gorgonzola Alfredo. I have made and replicated some of Olive Garden’s recipes before like their Olive Garden Chicken Gnocchi Soup or an old menu item they no longer carry for this Caprese Flatbread; both of which are two of my most popular recipes ever here on the blog. I made a good choice and the Steak Gorgonzola Alfredo was delicious; it also looked like it would be a pretty easy recipe to replicate at home and it sure was. 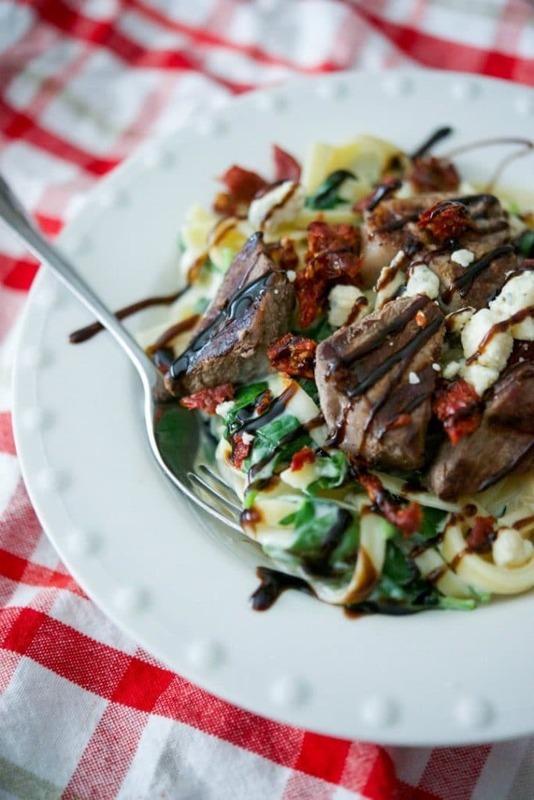 For this recipe you’ll need your favorite steak (I recommend either a strip or rib eye), fettuccine pasta, spinach, sun dried tomatoes, Gorgonzola and Pecorino Romano cheeses, either aged balsamic or balsamic drizzle, heavy cream, butter and flour. It sounds like a lot of ingredients, but many I have on hand all of the time. 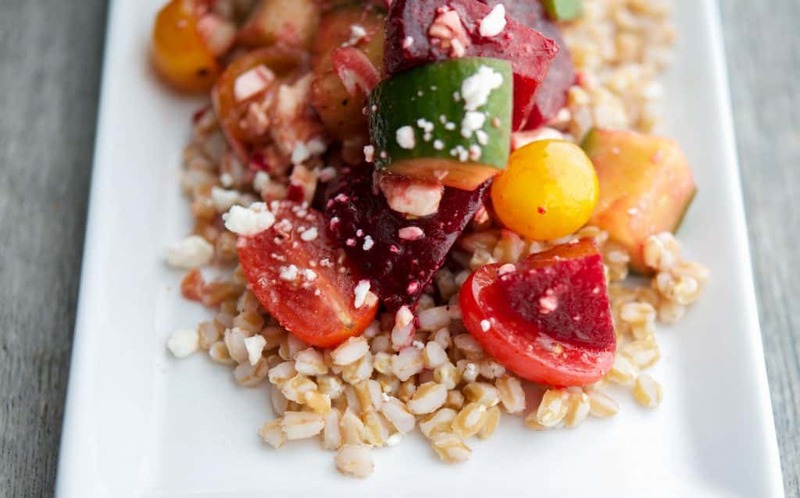 You will also need to do a bit of multi-tasking for this recipe, but the entire meal was ready in 30 minutes. First, you can grill the steak, boil the water for the pasta and portion out your other ingredients at the same time. I used my indoor Cuisinart griddler to grill a rib eye steak I had cut into medallions so they cooked a lot quicker. You can also cook your steak on a regular grill. Once the steak is done to your liking, remove it from the heat and set aside. While the steak is grilling, get a big pot of water going on top of the stove. Bring it to a boil; then add the fettuccine and cook until the pasta is al dente. Drain the water and return the pasta back to the pot. At the same time you can also portion out the remainder of your ingredients and get them ready to add once the pasta is done. Now it’s time to make the alfredo sauce; which is butter, flour, heavy cream and Pecorino Romano cheese. Add all of these ingredients to a small saucepan and cook over medium high heat for about 5 minutes until the sauce thickens; then pour the sauce over the cooked fettuccine. Add the spinach to the pot and mix well. The heat from the sauce will wilt the spinach. 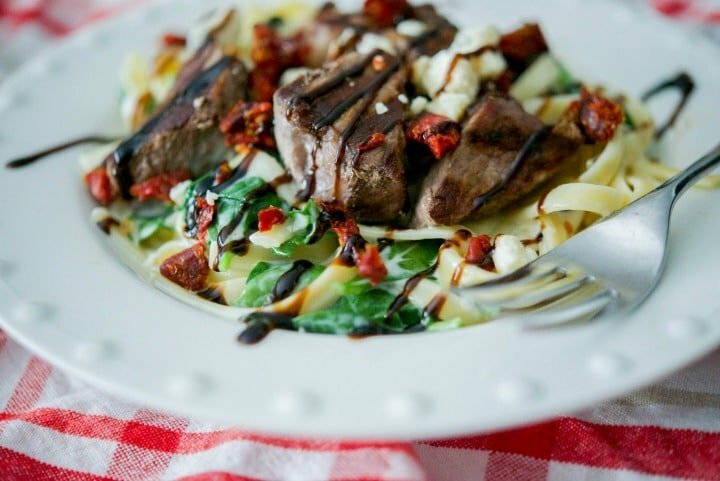 Place the pasta in a large serving bowl, sprinkle with crumbled Gorgonzola cheese and top with chopped sun dried tomatoes. 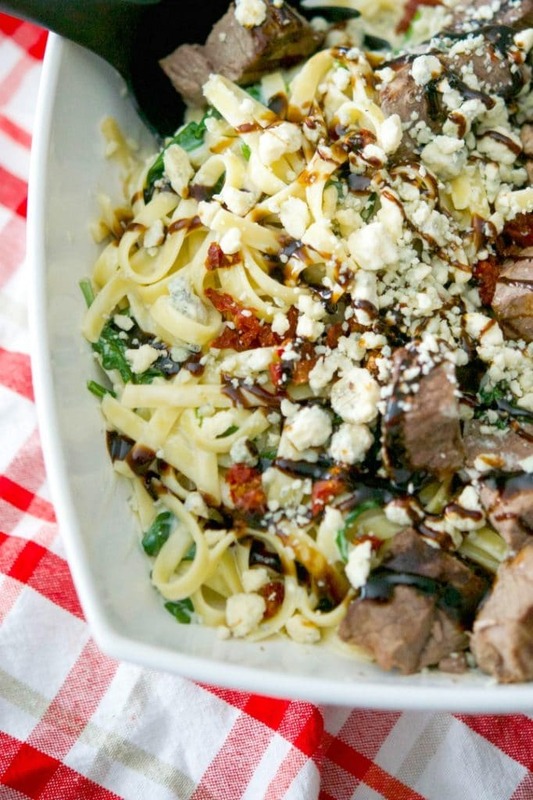 Add the beef medallions on top of that; then drizzle your balsamic glaze on top. Dinner is served! OMG this recipe was amazing! 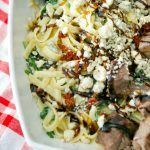 My family LOVED this Steak Gorgonzola Alfredo and it was so flavorful and it tasted just like Olive Garden’s menu item. This dish serves six people and is a little on the heavier side so we served ours with a tossed salad. ~Enjoy! 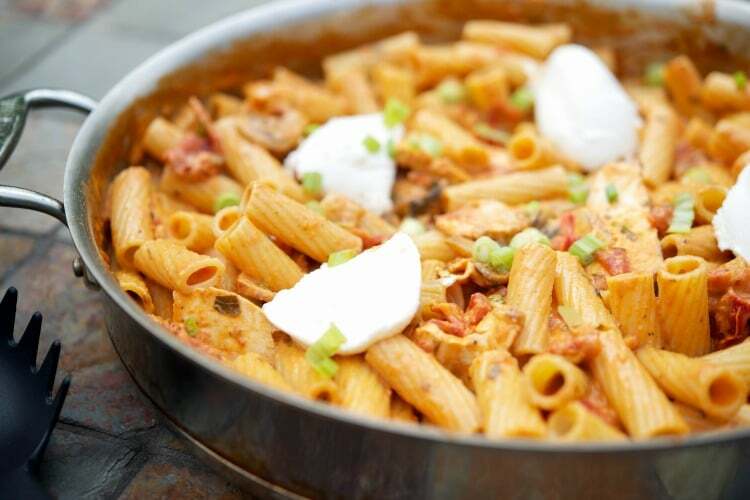 Bring a large pot of water to a boil on top of the stove and cook the fettuccine al dente. Drain and add the pasta back to the pot. Grill the steak until desired doneness. Remove from heat and set aside. Add the prepared alfredo sauce to the cooked pasta; then add the spinach. Stir until the spinach wilts and place the pasta in a large serving bowl. 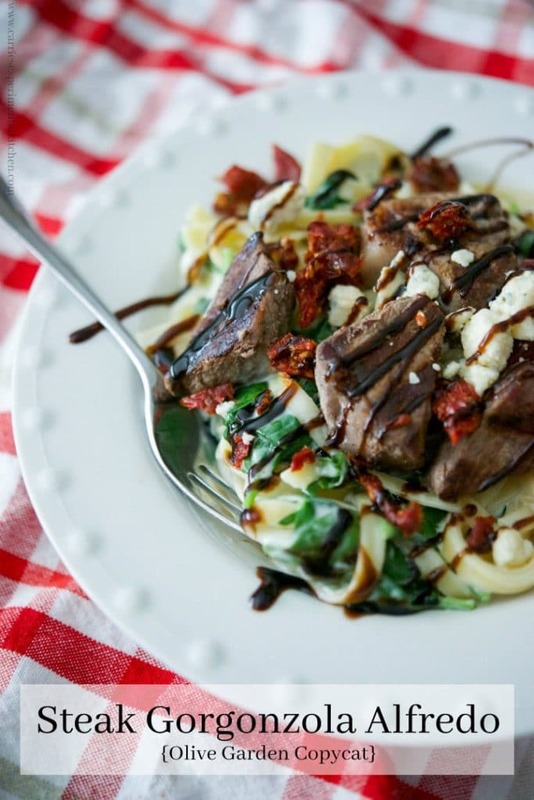 Top the pasta with the sun dried tomatoes, Gorgonzola cheese and cooked steak; then drizzle the balsamic glaze on top. Melt the butter in a small saucepan over medium heat; then whisk in the flour to form a roux. Add the heavy cream and grated cheese and whisk until the sauce thickens. I love the combination of flavors and colors, Carrie! Can’t wait to try it out! Actually, if someone runs a title that says copycat I feel it prudent to state that the Alfredo sauce is very definitely NOT an Olive Garden Alfredo sauce. I made this using the exact recipe from Olive garden for the sauce and, because my daughter doesn’t like sun-dried tomatoes, added yellow bell peppers. I also thin sliced garlic and put it in the sauce and when I stir fried the veggies. I used mixed super greens instead of the spinach as well. Thank you for the guideline, though. I really appreciate it. 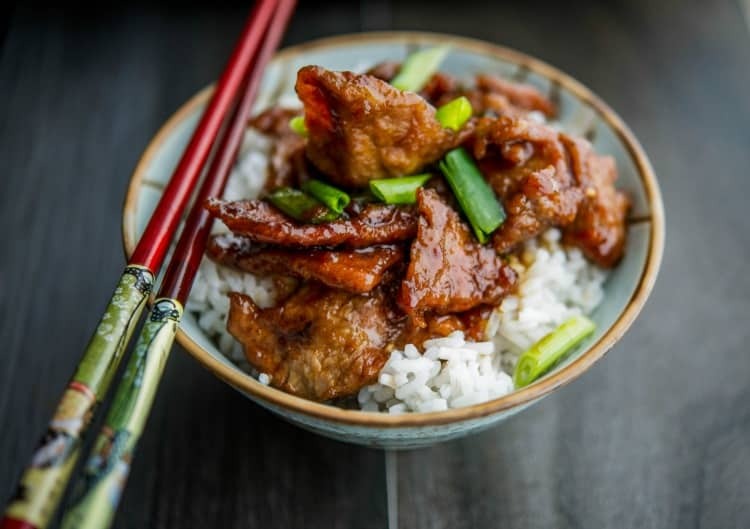 I made this recipe based on my interpretation after we tried it at the restaurant and what my family liked about the recipe; however, I’m glad you tried it and made it your own. Carrie…..This “sauce” was NOT nearly enough for all the ingredients….It made for a very dry pasta and we followed the recipe to a T.
I’m sorry to hear that Jessica. It was plenty for us; however, you can certainly double the sauce portion if you like it more creamy.